Gain a mastery of Spanish! Spanish Class contains a complete offline written Spanish course, together with interactive verb, vocabulary, grammar and listening exercises. All words and phrases are available to listen to as well. Great support when you learn Spanish. 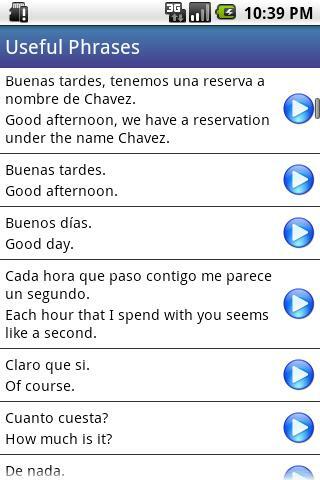 Easy to practice your verb conjugations, vocabulary, grammar and phrases with. * Highly customizable exercises on all of the above, with a fun awards system which makes practicing fun, with separate awards for the vocabulary, verbs, grammar, listening and speaking exercises. * Keeping track of your progress by saving statistics and summaries of all done exercises, together with errors made. The first strength of this app is the extended content. No other Spanish app offers this much for the same price. The other strength lies in its fun, addictive and useful exercises. 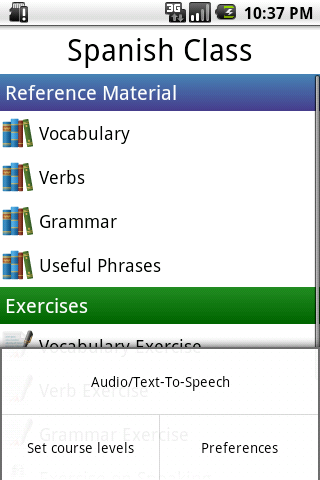 The app also contains a fun speaking exercise, which should not be taken very seriously as it is now Also, although basic voices are included, it is also possible to enable additional higher quality voices from within the app, but these have to be bought first from the third party company Svox. If you are serious about learning Spanish, this app is for you. We believe in a long term strategy for this app and customer feedback is very important to us. If there is something you do not like, please contact us at our developer email instead of giving us a 1 star rating. If you give us a 1 star rating, we do not even get your details so we cannot contact you back to solve the problem. If you contact us with a remark or problem and we fail to help you within a few days/weeks, depending on the severity of the problem, we understand that you give us a bad rating. Also, if your audio sounds way off, please read http://www.ceardannan.com/products/android-language-classes-text-to-speech. Your language apps rock!! The interface is well designed, simple yet very very effective and it is as you described, very addictive. Your language apps are the best on the market. You offer far more for less. Unbelievable! I'm blown away by this app. It's almost as good as my pc version that I paid $$$ for except voice recognition could be better. Definitely worth the money. Perfect format. I like how quickly you jump on comments. Keep up the good work. 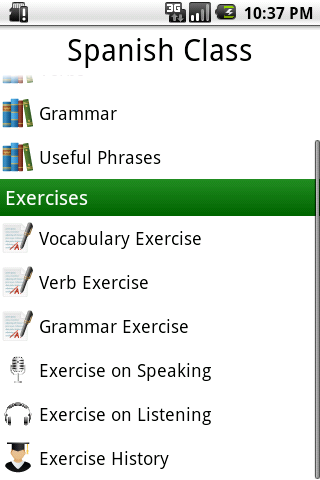 * Writing exercises: the word, verb and grammar exercises will get a “writing” instead of multiple choice option, which will present the user with a textbox to type in instead of the multiple choice questions, for a bit more of a challenge. * Image exercises, such as on clock times. * Making it possible to add your own words and phrases to the app throughhttp://www.languageshq.com.